For me, using atmosphere and light conveys a sense of place and the feeling of a place, and it’s always an important aspect of what I’m painting. Legacies can be tough stuff or they can simply be absorbed and appreciated, which seems to be where painter Anthony Benton Gude falls. His grandfather was the iconic artist Thomas Hart Benton, a fact that Gude believes led to his first mural commission, because there was an assumption that he, too, must be a muralist. After all, his grandfather’s famous America Today mural now occupies a room at the Metropolitan Museum of Art in New York. As it turned out, Gude did also become an accomplished muralist, with more than a dozen in Missouri and Kansas. And, like his “granddad,” he spent twenty years in the Midwest before returning to West Tisbury full time seven years ago. Gude was born on the Island and spent every summer on the family’s homestead overlooking Menemsha Pond, where he learned to quahaug and watched his grandfather paint in his studio. 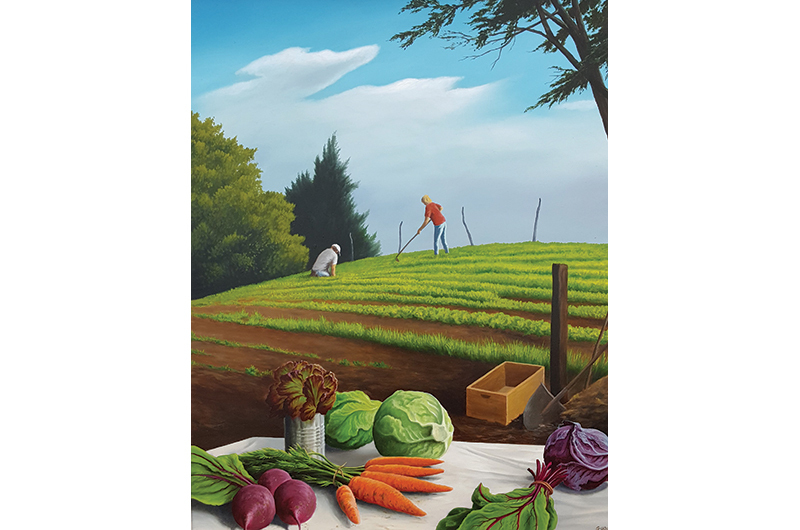 Anthony Benton Gude, Vineyard Farm Stand, oil, 24 x 30 inches. The painting here of Beetlebung Farm contains a technique adopted from grandfather Benton, which is to have a foreground of still life in a landscape painting. “It’s a combination of both,” says Gude. “I’ve loved doing that in a lot of my paintings, and most of my landscapes have it, because it brings you into the picture. It’s a compositional signature I’ve used over the years. “The piece was fun because the people on the farm were out there,” he recalls. “I elaborated a bit on the still life, but it’s still realistic because those are the kind of vegetables you find on a farm. Gude’s work can be seen at the Sargent Gallery in Aquinnah.